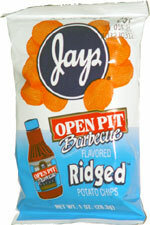 Taste test: These are narrow-rippled, fairly thick chips with a soft crunch and a good, somewhat tangy barbecue seasoning. These no real heat to the taste. They leave behind a lot of grease and barbecue powder on your fingers, which you can either wash off, or keep around for use as a secondary snack later. There's just a slightly hot aftertaste that lingers. Smell test: Good, tangy barbecue aroma, makes your mouth water.